Offers: Contact club directly for special promtions. Clubhouse with locker rooms, bar, restaurant, lounge, meeting rooms and pro shop. Golf facilities include driving range, chipping and putting practice areas. Carts, trolleys and caddies available for hire. Our concept calls for a championship course of 7,203 yards from 'the tips'. Kinloch is very traditional in design on a piece of land that is phenomenal. Open corridors allow adequate tee shot areas, the rolling topography creates a variety of shots, discreet bunkering and use of our 70-acre lake provide a number of hazard features and the greens have character and demand a degree of accuracy and skill. 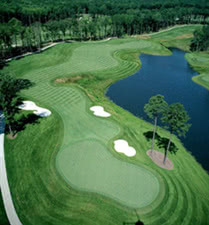 The course is designed to encourage walking, with most distances from green to tee being short. A quality caddie program is in place. Cart paths are limited where possible, but are situated to move play at a comfortable pace.